Established in 2018, Warehouse Space has been providing real estate construction services to property owners in throughout Maharashtra. Our company is located in Mumbai (Maharashtra, India). Clients can approach us for carrying out each and every aspect of their residential, commercial and industrial property construction requirements. Working with a wealth of industry knowledge, we are capable to work under any budget and timeline. 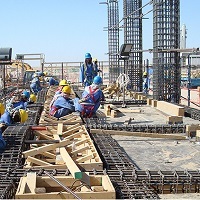 We have a team of construction engineers and project coordinators, who work in unity to meet the client’s requirements. Being a responsible entity, we make use of safety gears and accessories to ensure the well-being of our workforce and passersby. So, whenever you plan to construct a property or you seek assistance to add structure to your real property in Mumbai and Bhiwandi, get in touch with us for acquiring cost-effective solutions.